Prime Minister Binyamin Netanyahu visits Palmahim Air Force Base, meets pilots who took part in Operation Pillar of Defense. 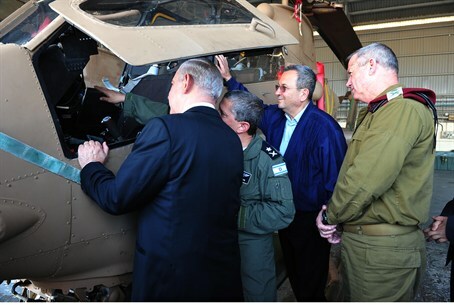 Prime Minister Binyamin Netanyahu, Defense Minister Ehud Barak, IDF Chief of Staff Lt.-Gen. Benny Gantz and GOC Air Force Maj.-Gen. Amir Eshel, visited the Palmahim Air Force Base on Sunday afternoon. The Prime Minister met with the pilots who took part in the aerial attacks in Gaza during last week’s Operation Pillar of Defense and said, "You carried out the missions that were defined for you in a precise manner. If the quiet is maintained – you will be able to continue preparing for the next campaign. “If the quiet is violated, you will go back and hit what's left,” added Netanyahu. “During the precise operation, Hamas's arsenals were hit very hard. In the IDF's precise operation, most of the missiles aimed at the center of the country were destroyed, as were thousands of missiles aimed at the south of the country. “As soon as the operation achieved its goals, there was no reason to continue it,” said the Prime Minister, referring to the ceasefire that came into effect last Wednesday. “We chose when it began and we controlled how it ended. If the quiet continues, it will be met with quiet. If it is violated, we will respond strongly. “I salute the reservists for their determination to be mobilized for the security of the state. It is very likely that we will need you in the future," he said. "The quiet will continue, and if not, we will resume our operations on whatever level is necessary,” Gantz said bluntly. The IDF hit more than 1,500 targets in Gaza during Operation Pillar of Defense, including 19 command centers, operational control centers and Hamas’ senior-rank headquarters, 30 senior operatives, 140 smuggling tunnels, 66 terror tunnels, dozens of Hamas operation rooms and bases, and 26 weapon manufacturing and storage facilities.